Wheeler Hall is not large enough to accomodate the 1,098 students enrolled in CS61A. Many students filed into Wheeler Auditorium for their Friday afternoon computer science class expecting to find a seat — they just didn’t expect that seat to be the floor. 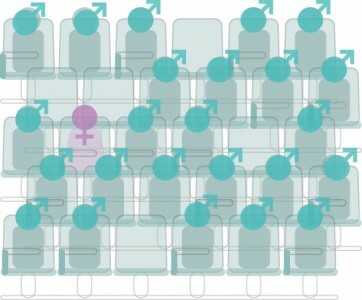 Though the auditorium is one of the school’s largest, it is unable to accommodate the increased demand for Computer Science 61A from majors and nonmajors alike. The class’s popularity is perhaps indicative of a growing demand for computer literacy campuswide. 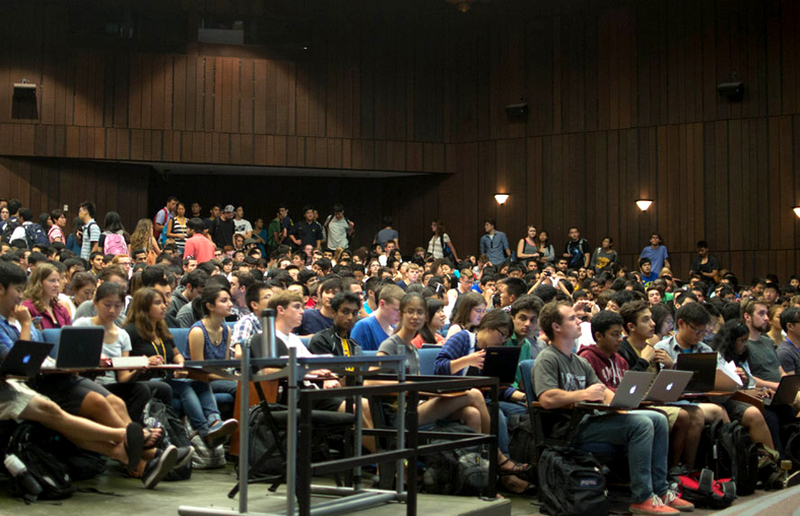 This semester’s CS 61A lecture is open to 1,098 students — almost 400 more than took the introductory computer programming class last fall. Wheeler Auditorium has a capacity of less than 750. “If you talk to a biology professor, they’re more likely to say, ‘Yeah, learn some computer science along the way,’ than they were a few years ago,” said the class’s lecturer John DeNero. 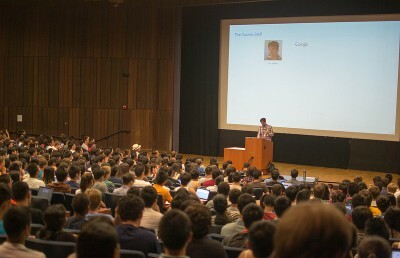 CS 61A, the first in a three-part series, focuses on the idea of programming in the abstract, with the second and third courses, 61B and 61C, addressing more advanced topics such as engineering software and the way in which computers execute programs. Key lower division computer science courses, including CS 10, the CS 61 series and CS 70, have seen a 174 percent increase in demand throughout the last five years, according to a campus report on curriculum. While some of the increased demand is linked to the growth of the computer science major, these courses also increasingly appeal to those outside the major, as computer literacy is “increasingly viewed by undergraduates as a core academic and professional competency,” the report said. Upper division courses have also seen increased demand and are maxing out the classrooms they are held in, Klein said. This summer, the campus announced plans to cap the computer science major in the College of Letters and Science sometime in the next calendar year. The last time the major had a minimum GPA requirement was 2005. This year, the first two parts of the CS 61 series have been given an additional $450,000 to help them better serve the greater campus population. The additional funding, allocated by the Common Good Curriculum Initiative, is intended to give campus departments more space and resources to grow key classes. This is the first year the CS 61 series is benefiting from the program. To cope with increasing demand, DeNero plans to webcast the lecture, post videos online before class and offer opportunities for students to get extra help from one of the dozens of assistants and readers for the course. Unis Barakat, a sophomore enrolled in the course, said that, although he arrived to class on time, he sat on the floor of the overcrowded auditorium during the first lecture. Still, Barakat said that his lack of a seat did not impact his ability to grasp the information given in lecture and agreed with DeNero that the smaller labs and discussions are key to doing well in the course. Last fall, the department tried to address growing demand for the course by opening a second lecture. However, the class was underattended because the second lecture time was in the evening, DeNero said. Ultimately, enrolling a large number of students and opening up more labs and discussion sections were better than the alternative — leaving prospective participants anxiously on the waitlist, he said. Check out the Daily Clog video that puts into perspective on exactly how big the CS61A class is. Contact Mitchell Handler at [email protected] and follow him on Twitter @mitchellhandler.